Restore collagen, replenish volume, and refresh you! RADIESSE ® Volumizing Filler wrinkle reduction is achieved by replenishing your skin’s lost volume. Upon injection, RADIESSE® Volumizing Filler immediately provides the volume and lift needed to diminish the signs of aging because of the calcium-based microspheres and gel that comprise the product. The longest-lasting injectable implants. Because of it’s components and duration, Radiesse® is more aptly referred to as an implant rather than a filler. It is used for soft tissue augmentation in the correction of deep facial folds and creases and restoration of volume loss in hollow facial areas. 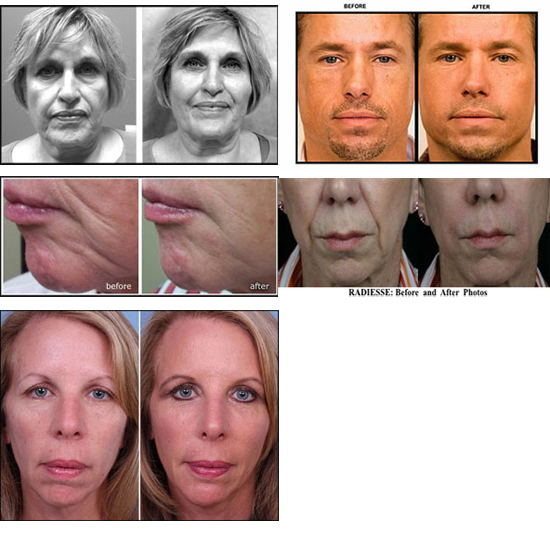 View a video on Youtube from “The Doctors.TV” about Radiesse®, a liquid facelift. Injections are more comfortable because it has been FDA approved for mixing with lidocaine, a kind of anesthetic. RADIESSE® replenishes the skin’s volume in a way so subtle that everyone will notice, but no one will know!